Hardware usage for CAD: current usage for desktop based hardware solutions is stable though a significant decline in future demand is predicted by survey participants. There are increases forecast in usage and demand for tablets, virtual solutions and in mobile phone usage (but from a low base). At present, 56% of CAD users utilize Desktop Workstations, 42% PCs and 33% Laptop PCs, this is stable across the last three years however, future usage is predicted to be much lower. On the other hand 19% of CAD users currently utilize Mobile CAD Workstations, 6% Virtual CAD Workstations, 5% Tablets and 3% Mobile Phones. Overall, CAD users are predicting significant increases in the usage of Virtual CAD Workstations, Tablets and Mobile phones. Virtual CAD workstation and Mobile Phone usage is predicted to double and to triple for Tablets. Certain types of hardware are slightly more prevalent by sector, for example, Desktop Workstations are currently used by 55% in Manufacturing, 60% in AEC and these percentages are forecast to drop to 32% and 50% respectively over the next 3 to 5 years. Desktop PCs are currently used by 39% in Manufacturing, 42% in AEC and are forecast to drop to 28% and 32% respectively. Laptop PCs are currently used by 32% in Manufacturing, 30% in AEC and are forecast to drop to 31% and 18% respectively. On the other hand Mobile Workstations are currently used by 19% in Manufacturing, 21% in AEC and these percentages are forecast to be steady in Manufacturing but grow to 25% in AEC. Virtual CAD workstation use is currently 5% in manufacturing and 9% in AEC and the forecast is for both to increase to 12%. Tablets usage is currently 5% in Manufacturing and AEC, forecast to grow to 17% in Manufacturing and 18% in AEC. 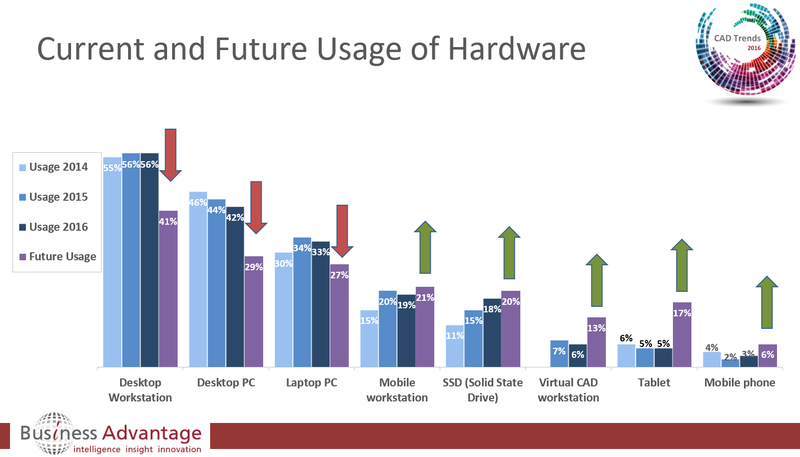 Clearly hardware vendors should anticipate replacing shrinking PC and desktop workstation hardware usage for CAD with increasing opportunities in Virtual Workstations and Tablets. Naturally the report is a high level summary of insights gained from the data gathered and this series of blog posts enables us to add further detail but if you are interested in still more detail, such as information on CAD hardware usage or growth predictions by region or industry, give us a call to chat with a research executive about your needs.